The Lachlan catchment features a broad geographic diversity that includes the temperate forests, woodlands and grasslands of the east, and the semi-arid woodlands, mallee and shrublands of the west. A large range of native vegetation makes up 40 per cent of the catchment. Located in central NSW and west of the Great Dividing Range, the Lachlan catchment borders the Murrumbidgee catchment to the south and the Darling catchment to the north. The Lachlan catchment occupies an area of around 90,000 square kilometres. Its landscape varies markedly from east to west as it moves from the headwaters and tablelands through the slope of the middle catchment to the flat western plains. Major rural centres drawing their water from the Lachlan catchment are Cowra, Parkes, Forbes and Young. Smaller towns in the catchment include Crookwell, Grenfell, West Wyalong, Condobolin, Hillston and Lake Cargelligo. The Lachlan River rises near Gunning and travels approximately 1,400 kilometres to its junction with the Murrumbidgee River. Nearly 1,300 kilometres of its total length is regulated. Very little water from the Lachlan River reaches the Murrumbidgee except during major floods. Most is taken up by water users or provides inflows to the wetlands in the lower Lachlan, particularly the Great Cumbung Swamp. View real-time data from the Lachlan catchment on this website. With a capacity of 1.22 million megalitres, the Wyangala Dam is the main regulating storage in the Lachlan catchment. It provides a regulated water source for irrigators and towns along the Lachlan River. A number of natural lakes have also been modified for use as storages, the largest of these being Lake Cargelligo at 36,000 megalitres, and Lake Brewster at 154,000 megalitres. Carcoar Dam, at 35,800 megalitres, is a relatively small storage on the Belubula River and supplies water for irrigation, stock and domestic use within the Belubula valley. Land use in the Lachlan catchment is dominated by extensive agriculture with 75 per cent of the catchment used for livestock grazing and 15 per cent for dryland cropping. Major water users are local councils, water utilities, mining and agriculture, including dairy, wool, beef and lamb, as well as irrigated crops such as cereals, lucerne and cotton. The Murray-Darling Basin Authority is developing the Basin Plan to set new rules to govern water sharing. The alteration of natural river flows through the construction of dams and weirs, and erosion from land clearing affect riverine health and contribute to water quality problems, such as salinity. 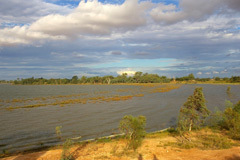 There are a number of significant wetlands within the Lachlan catchment considered to be of national significance, particularly as waterbird habitat. Nine of these wetlands, including Lake Cowal near Forbes, Lake Brewster, Booligal wetlands and the Great Cumbung Swamp, feature in the Directory of Important Wetlands in Australia. The department has released General Purpose Water Accounting Reports for the Lachlan catchment providing annual consolidated and informative summaries of water resources availability and water management issues. These reports have been produced using the Australian Water Accounting Standard. The water resources and management overview for the Lachlan catchment provides information on climate, land use, the environment, water resources, and river operations and management.